The search for new physics with a large underground xenon detector is like listening to your favorite song in a quiet room with high end headphones for the first time. Even if you have listened to the song a thousand times, you will be surprised by all the small nuances that have been there all along and that you did not hear before. This is either because it was too loud around you or because your headphones were not good enough. 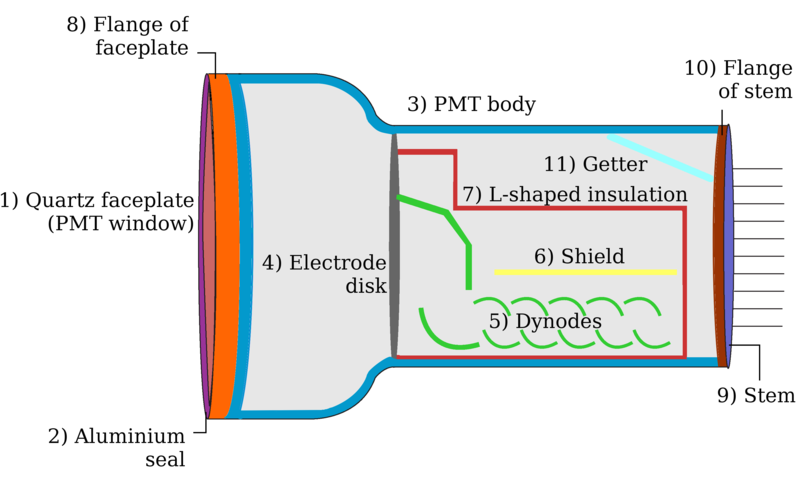 The quiet room in this analogy is the xenon detector that has been made from materials selected for their ultra-low radioactivity and that is shielded by a water tank, a mountain and ultimately the xenon in the detector itself. The high end headphones on the other hand are the extremely sensitive photomultipliers, data acquisition system and tailor-made software to read out the signals produced by particles interacting inside the detector. 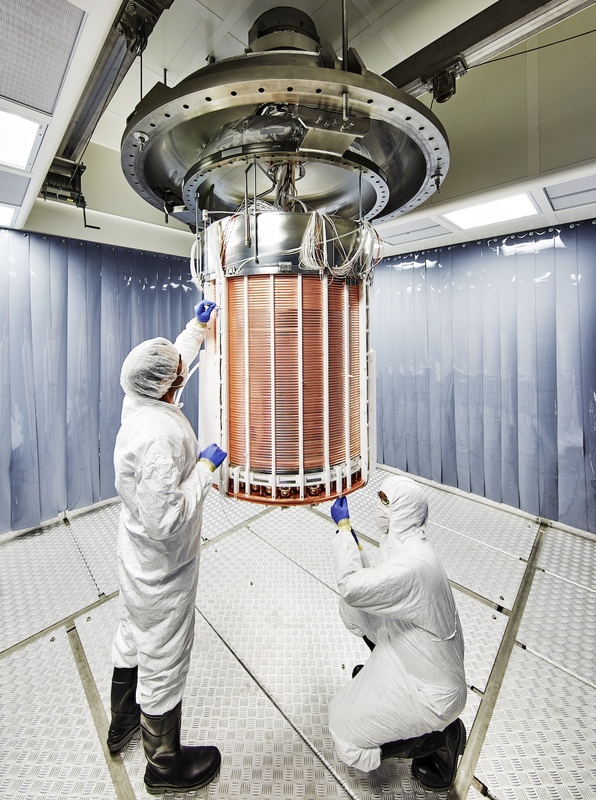 As you may have read before on this blog (we love to point this out…) XENON1T is the lowest background dark matter detector in the world. But the fact that the detector is so quiet does not mean that it does not measure anything. As a very sensitive instrument it is able to detect even the faintest signals from radioactive decays in the detector materials or the xenon itself. Over the course of one year these decays amount to a sizeable amount of data. The picture below shows what this looks like. 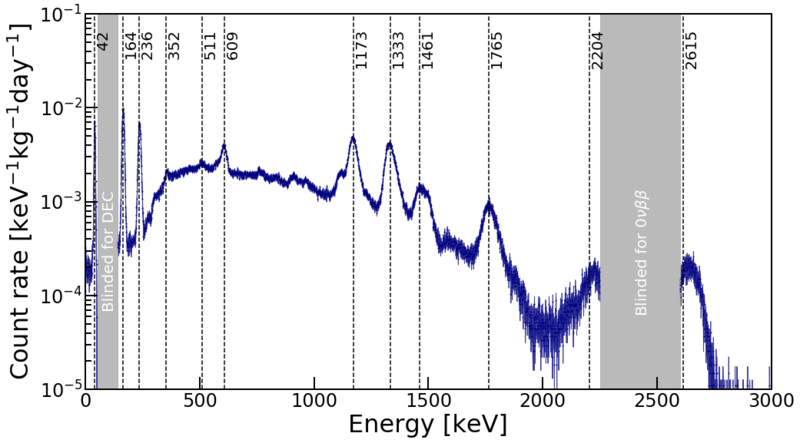 A preliminary energy spectrum from electronic recoil background data for the second science run of the XENON1T experiment. 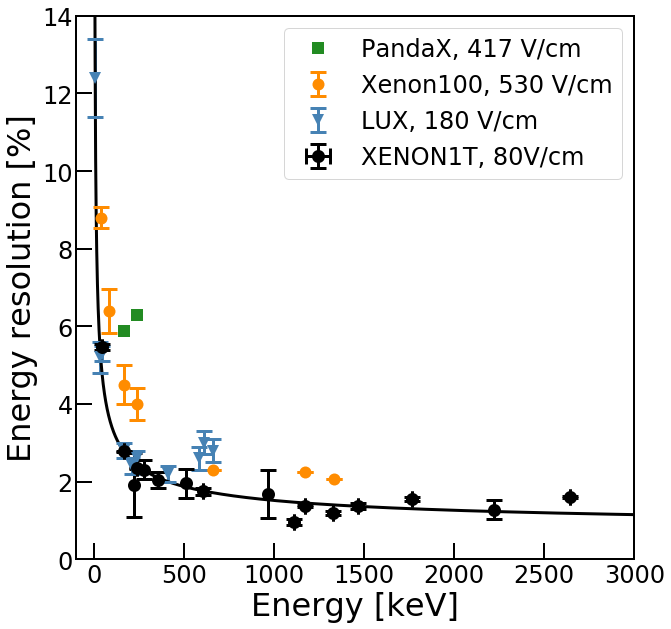 The x-axis denotes the energies of particles measured with the XENON1T detector. These are mostly electrons, x-rays and higher energy -rays. The y-axis shows how many of these particles have been counted over the whole measurement time of the last science run of the experiment. In order to have a better comparability with similar experiments, the event count has been divided by the live time of the experiment, its mass and the step size on the energy axis (the binning) in which we count. One can see that even in the highest peaks we measure less than one event per kilogram detector material and day of measurement time in a 100 keV energy window. A quiet room, indeed. And the features in the spectrum are all those nuances that one could not see before. So what are they? One can divide the spectrum into several regions. Only the small portion of data in the very left of the plot next to the first grey-shaded region is relevant to the standard dark matter search. The heavy and non-relativistic WIMP is expected to only deposit very little energy, so it resides here. The following grey region is blinded, which means it has deliberately been made inacessible to XENON analysers. The reason for this is that it might contain traces of a rare nuclear decay of Xe-124, the two neutrino double electron capture, that has not been observed until now, and we do not want to bias ourselves in looking for it. The large region from about 100-2300 keV contains multiple peaks. Each of these peaks belongs to a monoenergetic -line of a radioactive isotope contained in the detector materials or the extremely pure xenon itself. One can easily see that the peaks are sitting on an irregular continuous pedestal. This is created by -rays depositing only part of their total energy due to Compton scattering inside or outside the detector, decays of radioisotopes inside the detector, and the two neutrino double -decay of Xe-136. The latter produces a continuous energy spectrum over the whole energy range that ends at 2458 keV. The decay is rare, but becomes relevant due to the large amount of Xe-136 in the detector and the relative smallness of other background contributions. Xe-136 is also responsible for the second gray-shaded region at high energies which might contain an experimental signature of its neutrinoless double -decay. This hypothetical decay mode would produce a monoenergetic line centered at the end of the aforementioned spectrum at 2458 keV. The observation of this decay would be a gateway to new physics and complements the physics program of XENON1T. As their signatures have to be distinguished from other background components the energy resolution of the detector becomes crucial. Preliminary energy resolution of the XENON1T experiment as a function of the measured particle energy. To grasp the concept of energy resolution one can imagine the following situation in the energy spectrum. If you have two peaks next to one another, one your sought-after signal and one a pesky background, how far do they have to be apart in order to be seen as individual peaks? This of course relies on how wide they are. Thus, the energy resolution in XENON1T is characterized by the width of peaks in the energy spectrum relative to their measured energy. By fitting Gaussian functions to all the peaks in the spectrum at the top one obtains the ratio of peak width to peak center. This is what the above plot shows for several liquid xenon dark matter experiments. One can see that with an increase in particle energy the resolution improves. It is also evident that XENON1T leads the pack over a wide energy range. This is underlines that XENON1T is the astroparticle physics equivalent of high-end headphones. With these the XENON collaboration is in the position to pursue several exciting physics channels apart from weakly interacting massive particles. So stay tuned for the analyses to come. This entry was posted in Science and tagged 2018, analysis, background, dark matter, Double Electron Capture, neutrinoless double beta decay, XENON1T on March 12, 2018 by Christian Wittweg. To attain the high sensitivity needed to detect a dark matter particle with a xenon time-projection chamber, all other sources of particle interactions need to be eliminated or minimized. These interactions are classified as background events. Radiogenic backgrounds, in particular, come from radioactive isotopes within the detector materials that decay and lead to alpha, beta, or gamma emissions. Neutrons from spontaneous fission of heavy isotopes or from secondary reactions within the detector materials also contribute to the radiogenic background and can mimic a dark matter signal. To minimize the radiogenic background, the goal of the XENON1T radioassay program is to measure the radioactivity of all materials that are needed to build the detector and to select only the most radiopure materials for the final construction. To do this, we use mass spectrometry techniques and high-purity germanium spectrometers that are capable of measuring radioactivity at the level of 10-6 decays per second in a kilogram of material (Bq/kg). As comparison, a typical banana has an activity of ~102 Bq/kg! Because natural radioactivity is present in the soil, the water, and in the air, it is also present in the XENON detector materials. The Figure shows a measurement obtained with a germanium spectrometer of the gamma rays emitted from a sample of photomultiplier tubes. The background (purple spectrum) is subtracted from the sample (pink spectrum) in order to quantify the expected activity from a XENON1T component or material sample. A high-purity germanium spectrometer measurement of gamma rays emitted from a sample of XENON1T photosensors. Some prominent isotopes from different sources are labeled: primordial uranium and thorium decay chains (green), potassium (red), man-made (orange) and cosmogenic (orange) isotopes. The most common radioactive isotopes present in the Earth are primordial uranium and thorium, each of which decays into a series of other radioactive isotopes (marked in green in the Figure). Potassium (red) is also a common, primordial isotope that is found in soil, and subsequently in food and in your body. Other isotopes that are found in detector materials come from interactions with cosmic rays (yellow) or from man-made activities (blue), i.e. industrial or medical use, nuclear power plant emissions, nuclear accidents, and military testing. 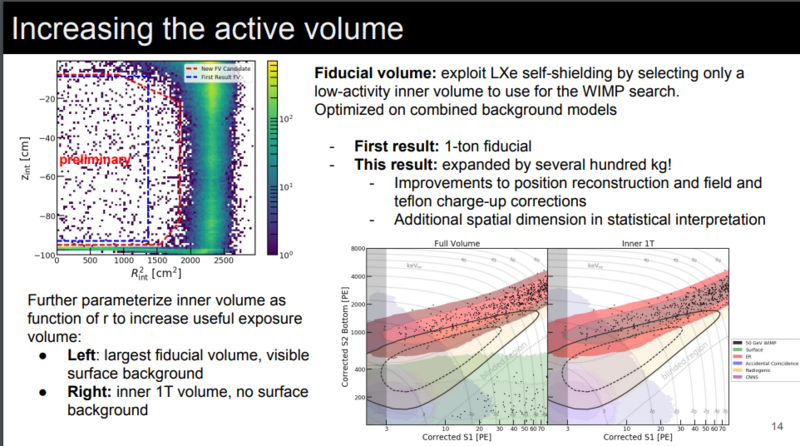 The measured activities of each material selected for detector construction are used in simulations of XENON1T to determine the expected background. This allows for a prediction of the attainable sensitivity of the detector to dark matter interactions. The radioassay measurement results from over 100 material samples are presented in our new paper “Material radioassay and selection for the XENON1T dark matter experiment”. This entry was posted in Publications and tagged 2017, background, construction, publications, screening, XENON1T on May 5, 2017 by Michelle Galloway. This talk by Michael Murra (slides) was presented at the XeSAT2017 conference in Khon Kaen, Thailand, from 3. – 7. April 2017. 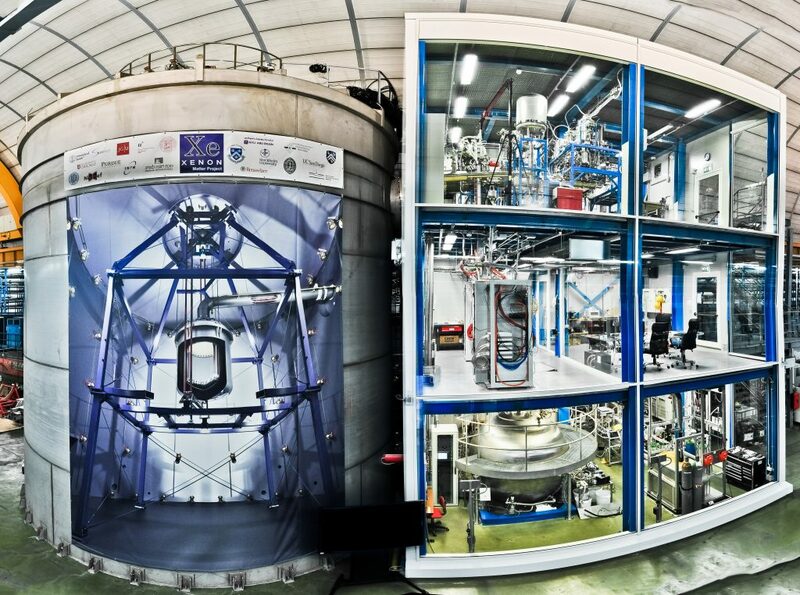 The main background for the XENON1T experiment are the intrinsic contaminants krypton and radon in the xenon gas. 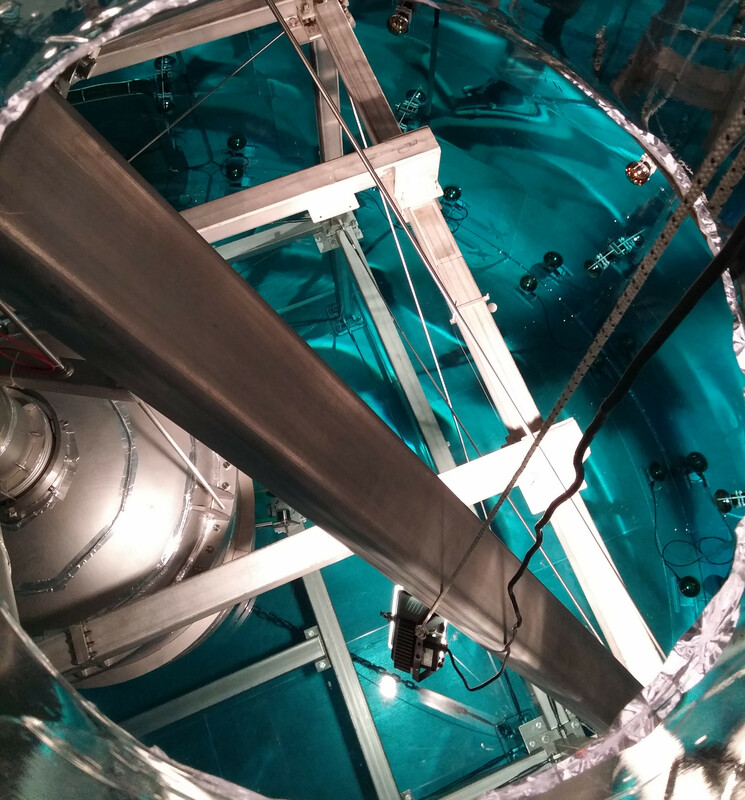 Instead of purifying the xenon once before starting the science run we were able to operate our distillation column in a closed loop with the XENON1T detector system running during its commissioning phase. This resulted into reducing the krypton concentration quickly below 1 ppt (parts per trillion, 1 ppt = 10^(-12) mol/mol) without emptying and refilling of the detector. In addition, the column was operated in the same closed loop in inverse mode in order to reduce Rn-222 by about 20% during the first science run. This so-called online removal for both noble gases along with the working principle of the distillation system are presented within this talk. This entry was posted in Talks and tagged 2017, background, distillation, krypton, radon, XENON1T on April 18, 2017 by Michael Murra. The water acts as a passive shielding against external radioactivity. In addition, using the photomultipliers that can be seen towards the right of the picture, the water acts as an active muon detector. Muons may induce events in the xenon detector that may mimic dark matter signals. We therefore turn a blind eye (“veto”) for a short time whenever a muon travels through the water tank. This entry was posted in Experiment and tagged 2016, background, commissioning, Muon Veto, water tank, XENON1T on January 23, 2016 by Rafael Lang. 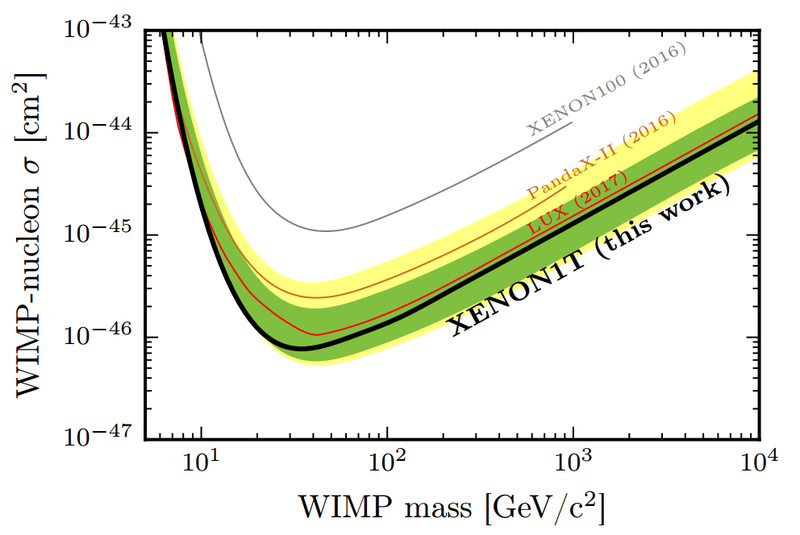 One of the many advantages of using xenon as a dark matter target is that xenon has no naturally occurring long-lived radioactive isotopes. However, when xenon is distilled from air, about 1 krypton atom per billion xenon atoms is also gathered. A very small fraction of these krypton atoms, only one in one hundred billion, are the radioactive isotope 85-Kr. The decay of 85-Kr releases an electron which can then scatter in the xenon detector. These electronic recoil events can potentially obscure even rarer signals from interactions with dark matter. Thus, for dark matter detectors using liquid xenon, the krypton needs to be removed. This is done by passing the xenon through a cryogenic distillation column specifically designed for removing krypton. After going through the krypton column, the xenon is very clean. 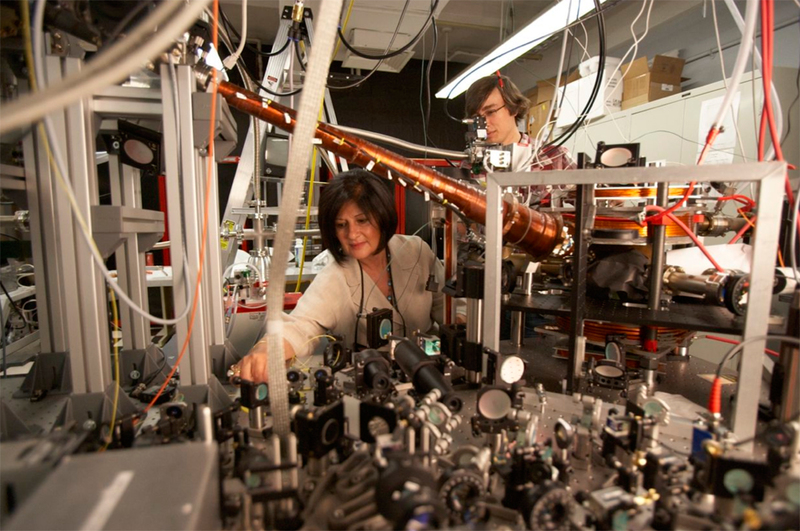 For XENON100, there are only ~10 krypton atoms per trillion xenon atoms. Finding one of those krypton atoms is like picking out one single star from the entire Milky Way galaxy. 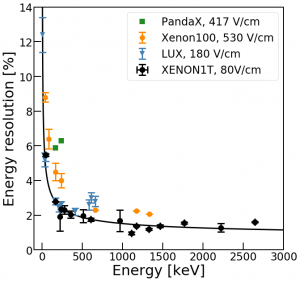 XENON1T has 10 times even less krypton in the xenon. Measuring such a tiny amount of krypton is not trivial. One way is to look for the decay signature of 85-Kr using the XENON detector itself. However, due to its relatively long half life (~11 years), it takes many months to get an accurate estimate with this method. So, how do we measure the tiny amount of krypton relatively quickly and accurately? An atom trapping device has has been developed by the group at Columbia University to do exactly that (see E. Aprile, T. Yoon, A. 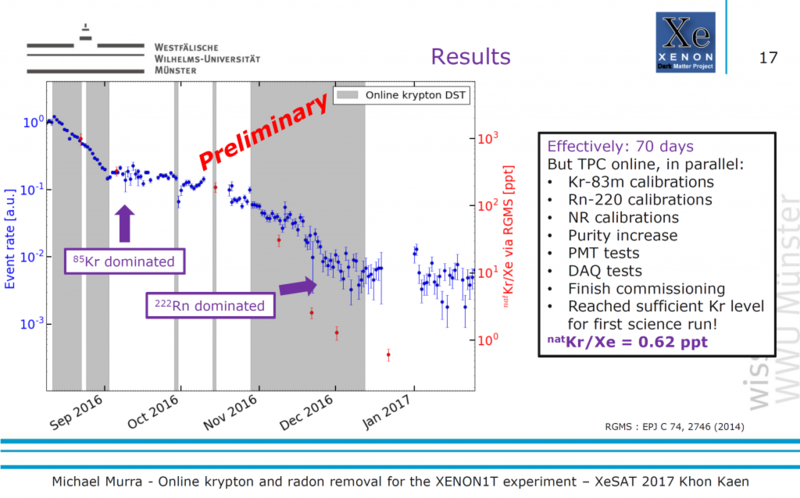 Loose, L. W. Goetzke, and T. Zelevinsky, “An atom trap trace analysis system for measuring krypton contamination in xenon dark matter detectors”, Rev. Sci. Instrum., 84, 093105 (2013), arXiv:1305.6510). The method, called Atom Trap Trace Analysis (ATTA), was originally developed at Argonne National Lab for the purpose of radioactive dating. 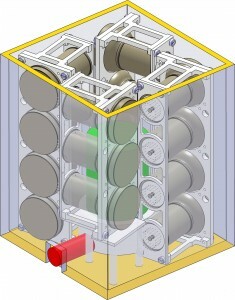 It has been adapted to measure samples of xenon gas taken directly from the XENON detectors. All ATTA devices have the same operating principle: traditional laser cooling and trapping techniques are employed to selectively cool and trap the element of interest present in the sample. 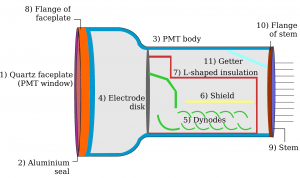 The trapped atoms emit light which is detected by a photo detector, in our case an avalanche photodiode. The trapped atoms can thus be counted. The Columbia ATTA device is designed to be sensitive to single trapped atoms, since for clean samples the average number of krypton atoms in the trap at any given time is close to zero. The rate at which the atoms are loaded into the trap is the number we are after. The device is calibrated carefully in order to find the trapping efficiency, i.e. the fraction of krypton atoms that get trapped and counted successfully. Multiplying the measured loading rate for a given sample by the known trapping efficiency gives the total number of krypton atoms flowing through the system. Finally, measuring how many xenon atoms flow through the system at the same time allows the krypton fraction to be calculated. The entire measurement can be completed in one working day. 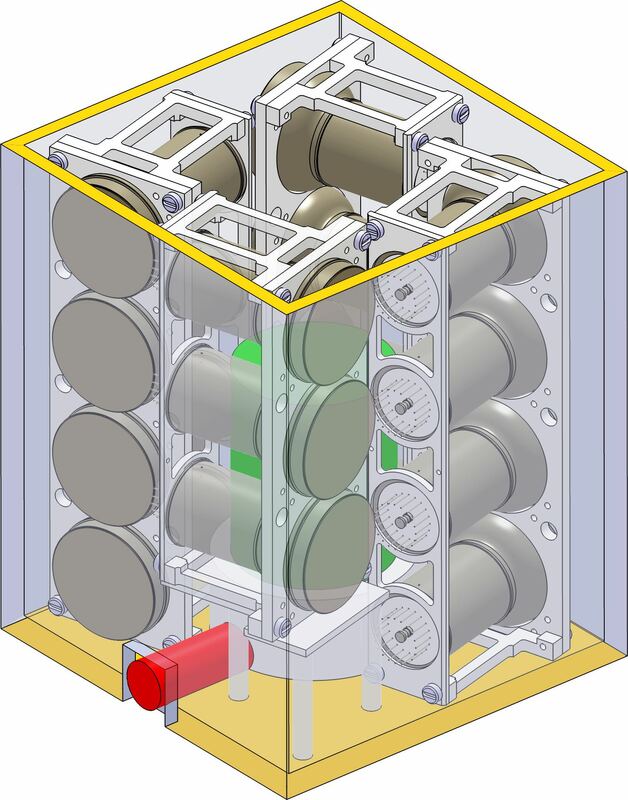 The Columbia ATTA device allows the xenon used in XENON1T to be assayed for krypton contamination quickly and accurately, thus ensuring that krypton levels are safe before beginning a dark matter run, and during the run itself. And it looks pretty cool, too! This entry was posted in Experiment and tagged background, columbia, krypton, xenon on March 29, 2014 by Luke Goetzke. E. Aprile et al. 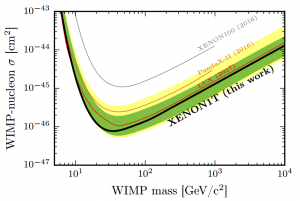 (XENON100), The neutron background of the XENON100 dark matter search experiment, arXiv:1306.2303. The paper is also published in Journal of Physics G 40 (2013), 115201. This entry was posted in Publications and tagged background, publications, XENON100 on June 23, 2013 by Rafael Lang.